Welcome to fast, easy business funding with PayPal Working Capital. Four reasons to choose PayPal Working Capital. Your cash advance is based on your PayPal sales so there are no long forms to complete and most applicants receive a decision straight away. Unlike most traditional financing, you pay one agreed, affordable fixed fee. So no interest, fees or hidden charges. To apply for PayPal Working Capital, you must have had a PayPal business account for 3 months and process minimum annual PayPal sales of £9,000. PayPal sales history and account behaviour determine eligibility. 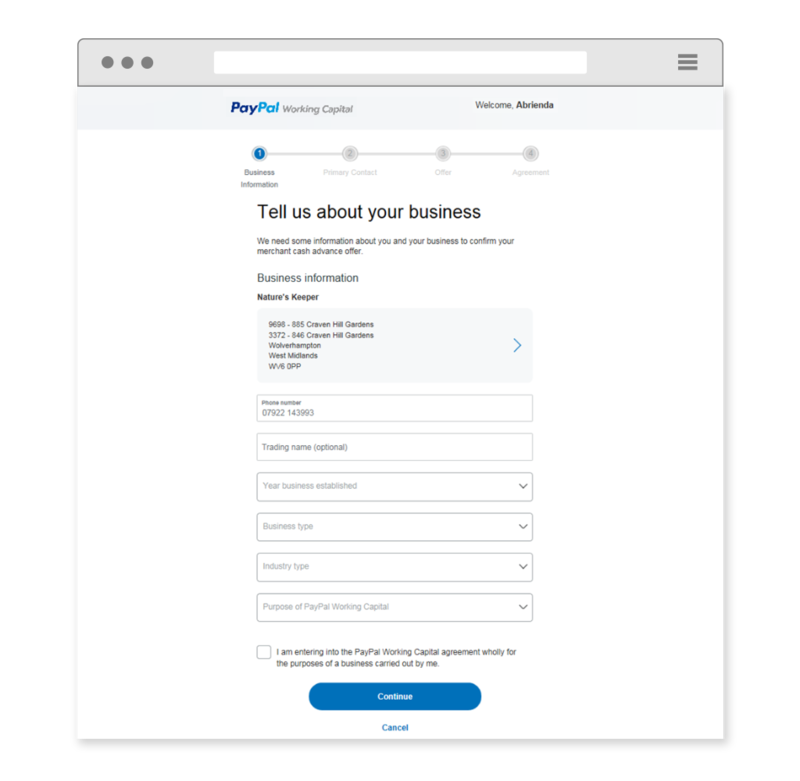 New to PayPal? Set up a PayPal business account today. It’s a simple application form with a quick approval decision. Get started now. Choose the amount of funding you would like to receive and pick the repayment percentage of your future sales you’d like to go towards your combined advance and fixed fee amount. The maximum amount is based on your PayPal sales and account history. 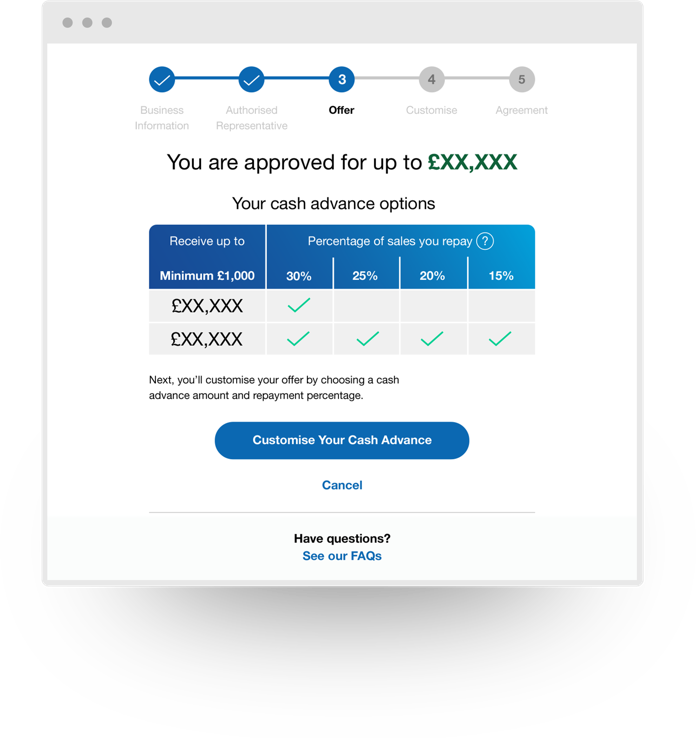 Once you’re approved, your cash advance will go straight into your PayPal account. Your percentage-based repayments will be automatically deducted from each transaction, until the full amount (including your fixed fee) is repaid. There are certain requirements you must meet to maintain your cash advance, including a minimum level of repayments. PayPal Working Capital makes it fast and easy for your business to get funding. Thank you. We have your call back request and we’ll be in touch in the next 2 working days. Your request has not been submitted. Please try again or call PayPal Working Capital 0800 368 7173. Enter your details below and we’ll be in touch. Select the amount of the merchant cash advance you’d like to receive for your business. The maximum amount available will depend on your PayPal sales and account behaviour. Choose the percentage of your future PayPal sales that will go towards repayment of the merchant cash advance and the associated fixed fee. Receive the funds straight away to use as you wish for your business. Your repayments will be taken from each of your future sales until your merchant cash advance and fixed fee have been repaid. You can also make additional repayments without any additional charges. 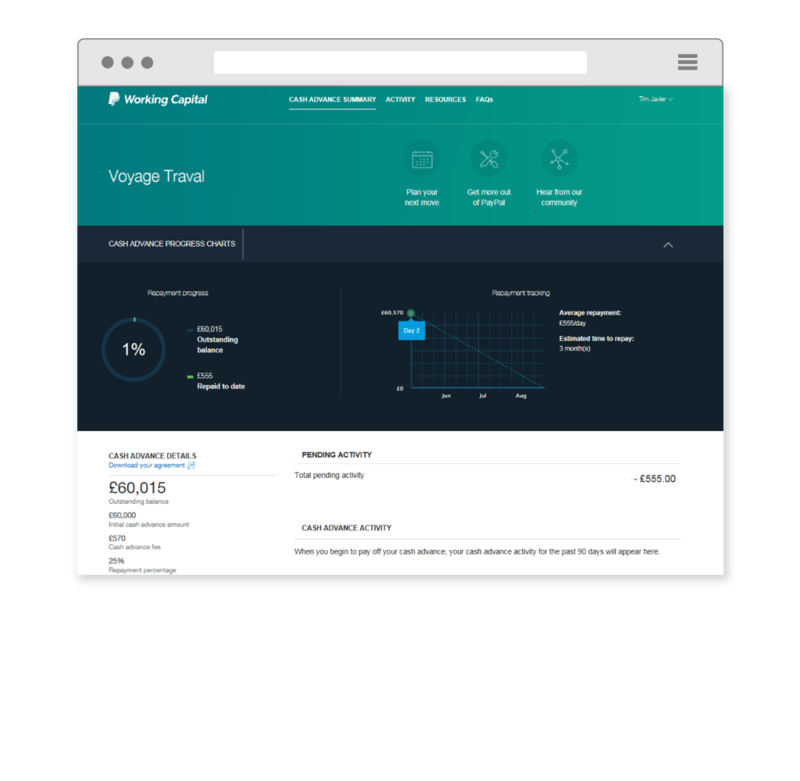 How do I view/service my PayPal Working Capital account? How do I repay my merchant cash advance? *Subject to approval at the time of application. PayPal reserves the right to review its eligibility criteria or to withdraw this offer at any time, without notice. **Customers must not divert sales from PayPal while the cash advance is outstanding and a minimum level of repayments is required. Please see the terms and conditions for more information.